Tom Shepherd, Ph.D.: Explore Gospel of Mark (Verse by Verse) Bible Study: . Our Products >> Explore Mark's Gospel (2 Albums: 16 hrs) By Tom Shepherd Ph.D. 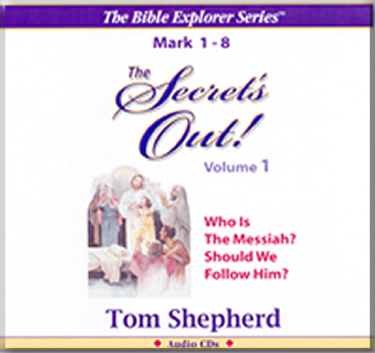 Explore Mark's Gospel (2 Albums: 16 hrs) By Tom Shepherd Ph.D.
Volume 1 -- Who Is The Messiah? Should We Follow Him? Volume 2 -- Where Is Jesus Going? Dare We Follow Him? Who is Jesus, really?That is the question that dominates the first half of the book of Mark. People are amazed at His authoritative teaching and miracles. The twelve disciples follow Him but have trouble understanding who He is. It is only the demons that seem fully aware of His power, and He silences them again and again. Finally, the disciples recognize who He really is -- but this brings them to a most troubling discovery. Do you know who Jesus really is? Or are you living with an illusion of this man? Rediscover the real Jesus through Mark's story and learn the secret of His life in this Bible Explorer Series. Tom Shepherd, PhD :: is Professor of New Testament Interpretation at Andrews University Theological Seminary where he now teaches Dr. Paulien's former classes at Andrews University Theological Seminary. Dr Shepherd has also served as: Professor of Religion, Ethics, and Missions at Union College, Professor of Theology at Instituto Adventista de Ensino Campus Central, Sao Paulo state, Brazil; and Health Director for ADRA in Malawi, Africa. Volume 1 -- Who Is The Messiah? Volume 2 -- Dare We Follow Him to the Cross? Who? What? When? Where? Why? Who Do You Say I Am ? Copyright © 2012-2019 Shop.TheBattleOfArmageddon.com. All rights reserved.